In the summer of 1914, an American journalist and author, Roy Norton (1870-1942? ), was travelling in Germany, having spent a year in that country and the previous ten years in Europe. In the final weeks before the beginning of the the European War... the Great War ... World War One ... his final observations included Germany's military preparations ... and how its citizens were incited by the government to suddenly go to war. He made several references to Germany's war railways during this period which appear below. Soon French, British - and notably for this website: Canadian railroaders sent to Europe ... would be working against this sophisticated wartime transportation system of Germany's. Norton's article "The Man of Peace" was published in the series Oxford Pamphlets 1914-1915. These were articles which worked to explain, justify, and promote Britain's involvement in the war. While this website and other accounts focus on the Western Front in France and Belgium ... "The Only Front is the Western Front !" ... this was a war which was being fought by the allies and colonies of the European great powers ... all around the world ... in Africa, South America, Asia, and the South Pacific. 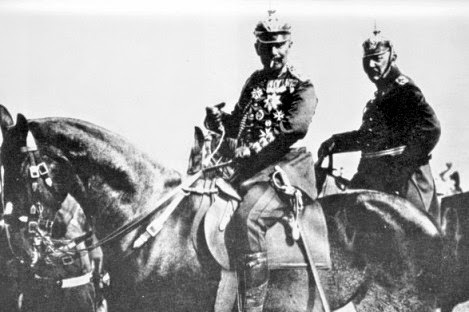 Norton's "Man of Peace" was Germany's Kaiser Wilhelm II on whose shoulders he squarely placed blame for the war. 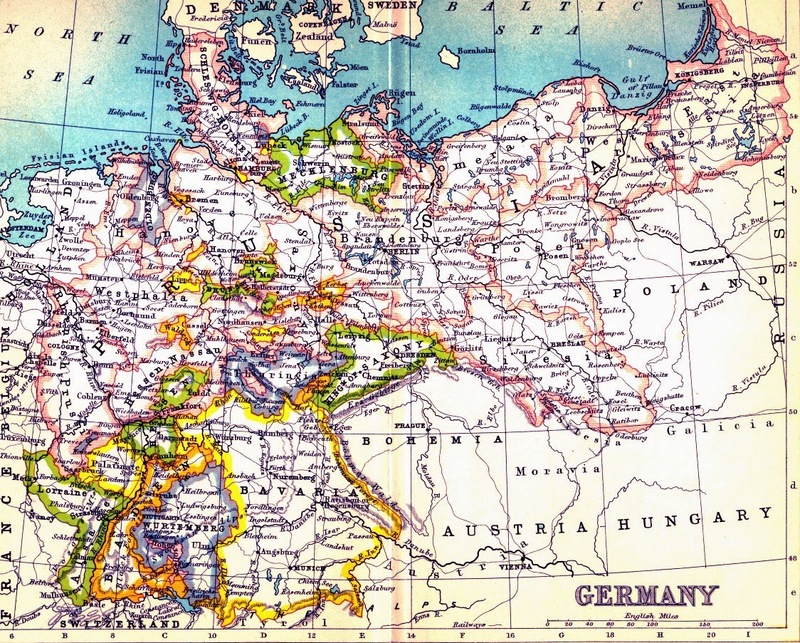 A map of the various states and kingdoms which united to form Germany ... published circa 1900. Main railway lines and rivers are shown on the map. Initially there were numerous private railways in Germany, and some Germanic states had their own railways as well. Railways were a 'British invention' and the Germans imported the technology along with the idea that private companies would usually furnish the capital and operate the lines for a profit. Eventually in such a system, secret tariffs evolve ... which allow railways to charge more for captive traffic (e.g. your neighbourhood coal mine) and less for traffic they wish to win. Strong railways hammer weaker competitors with predatory pricing. There is generally no 'transparency' for less significant consumers - for example, small shippers or even individual railway passengers. Eventually, only the most shrewd and experienced passengers can travel from Point A to Point B across multiple railway companies without being gouged or greatly inconvenienced by the multiplicity of private railway schedules which were never designed to mesh. Working under Germany's Prussian King in the late 1800s, Prussian Premier (later German Chancellor) Otto von Bismarck saw railways as "instruments for conveying the national traffic" and stated that their acquisition by the state for the general good was "a matter of course". Unnecessarily high working expenses and charges, and unnecessary duplication of routes and services. Chaos in the various freight charges regimes. Movement of goods and passengers nationally was impeded as competitors tried to harm each other. In 1876-1879 Bismarck worked to bring the railways under state ownership and control AND to provide preferential rates for freight shipment WITHIN Germany - to benefit German industries. State railway ownership increased from 6,300 km in 1879 to 31,000 km by 1902. Circa 1900: A Prussian-styled locomotive for fast, medium tonnage passenger trains. "In Great Britain, it requires years of travel and of careful observation to learn one's way across the country, and its numerous lines, and to avoid the many pitfalls which are everywhere placed in the way of the inexperienced traveller. In Germany, such pitfalls do not exist, and the greatest simpleton will travel as cheaply, and comfortably, and as rapidly all over the country as will the most cunning commercial traveller." "In Germany, railway trains arrive, in nineteen times out of twenty, to the minute, because the Government punishes severely those who are responsible for delay." "The German freight tariff is of beautiful simplicity ... every trader possesses a little book by means of which the office-boy can calculate in a moment the exact amount of the freight charges for any weight between two stations." Germany generally had the largest and most powerful locomotives of all European systems. However, they were smaller than the contemporary [North] American standard. Bridge capacity and tunnel clearances - from earlier construction near the dawn of railways - limited trains to about 120 axles (maximum : 30 cars with a maximum capacity of 15 tons each). Particular engines were assigned to specific engineer/fireman crews - not 'pooled power'. Only larger power was double-crewed to keep it working most of the day. Firemen arrived for work 2 hours before departure to start the fire and hostle their locomotive. Engineers went on duty 1 hour before departure and the engine crew attended to all aspects of locomotive preparation. At the end of their assignment, engine crews would stay on duty to attend to any adjustments necessary to their engine. After a run, crews were required to be off duty for 8 hours before another assignment. Small improvements in fuel efficiency were meticulously recorded ... and reinforced by small rewards from the railway. Higher efficiency fuel briquets were manufactured from Germany's low quality brown coal ... for use when low smoke or additional evaporative capacity were required. "... with the assigned engines the men act as if they were footing the fuel bills themselves ..."
The German state railway reportedly paid lower wages than North American railways. However, this was offset by the provision of subsidized, well-kept "living colonies" near urban railway terminals for the crews and their families. Railway officers (managers) were given family apartments within their own large terminal buildings - again at a significant discount. Elsewhere in the industrialized world, the motivation for creating company towns ran the gamut from benevolent paternalism ... to exploitive avarice ; with the employer's reward ranging from achieving their Christian duty to their fellow humans ... to effectively enslaving their employees ("I owe my soul to the Company Store") to satisfy their selfish greed. The German state railway "urban colony" perhaps fell between somewhere these two extremes. 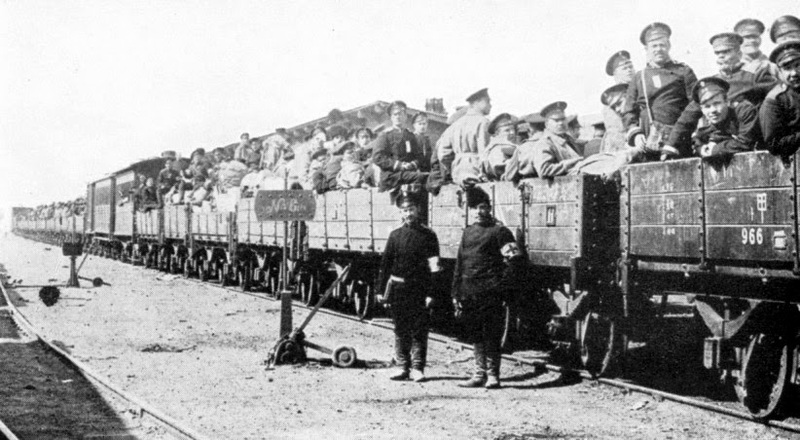 The railway's unusual characteristic was that it was a 24 hour essential operation, to support Germany. As the German state employees lived on railway property, generally within a large city, their availability for work without travel delay was assured ... very much like Schreiber, Ontario once was. Often people have reflected on the railway culture and its 24 hour demands on workers' lives. With the German system, perhaps it was more like a railway family lifestyle which kept all members of a railway family in contact with other railway families as their immediate neighbours ... again, much like Schreiber, Ontario once was. It seems likely that many railway children would follow in their parents' professional footsteps on the German state railway. The railroaders were accustomed to living and working together and behaved as if they 'owned' their equipment and 'footed the bill' for its fuel. Failing to stay on schedule was already a serious transgression in peacetime. With a loyal, cohesive group of railroaders conditioned to follow standardized procedures one could imagine that German troop and supply trains would run like clockwork. It was told me in March, of this year, by one who is almost as great a military editor as there is in the "Fatherland", that the completion of the improved Kiel canal was the very last act that possibly could be effected in "preparedness".
" 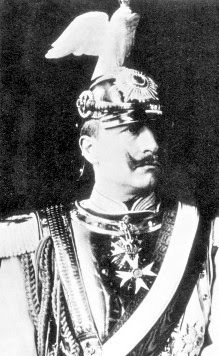 From now onward ", declared this man, " Germany needs nothing more than the natural increase in her navy, and maintenance of her efficiency in arms. At present we are probably armed better than any other nation in the world. We have adequate reasons for confidence that this is so. Our military railways are now perfected." It did not dawn on me at that time that usually, when a man's preparations to do something have been perfected, he finds a way to go ahead and do that thing of which he has dreamed and for which he has prepared. I did observe, however, that scattered over Germany were more of those wonderful "switch" or "shunting" yards, capable of entraining tens of thousands of soldiers in a few hours yards where from ten to twenty passenger trains could be drawn up at one time, and oddly enough, some of these queer yards, all equipped with electric lighting plants, are out in places where there are not a dozen houses in sight. In some of these yards, located at central points for rural mobilization, one saw long trains of troop cars, dingy, empty, stodgily waiting for use in war, if one ever came. I was told of one test mobilization (in reply to my query as to why I had seen so many troops pass through a small place one evening), where twenty thousand men were assembled at ten o'clock one morning, made a camp complete, were reviewed, entrained, detrained, and just seven hours later there was nothing save debris and trampled grass to show that the place had ever been disturbed. At a mere "Tank-station" [i.e. the location of a water tank to replenish locomotive tenders with no civilian settlement] below Kriesingen, on June 12, I saw probably seventy-five or a hundred locomotives (I had time to count more than seventy), most of which were of antiquated type obsolete as far as the demands of up-to-date traffic are concerned and of a kind that would have been "scrapped" in either England or America. Yet these were all being cared for and "doctored up". A few engineers and stokers worked round them, and I saw them run one down a long track and bring it back to another, whereupon hostlers at once began drawing its fires, and the engineer and stoker crossed over and climbed into another cab. "What do you suppose they are doing that for ?" I asked one of the train men with whom I had struck up an acquaintance. "Why," replied he with perfect frankness, "those are war locomotives." Reading the look of bewilderment on my face, he added, "You see, those engines are no longer good enough for heavy or fast traffic, so as soon as they become obsolete we send them to the reserve. They are all of them good enough to move troop trains, and therefore are never destroyed. They are all frequently fired up and tested in regular turn. Those fellows out there do nothing else. That is their business, just keeping those engines in order and fit for troop duty. There are dozens of such depots over Germany." "But how on earth could you man them in case of war ? Where would you get the engineers for so many extras ?" He smiled pityingly at my ignorance. "The head-quarters know to the ton what each one of those can pull, how fast, where the troop cars are that it will pull ; and every man that would ride behind one has the number of the car he would ride in, and for every so many men there is waiting somewhere a reserve engineer and stoker. The best locomotives would be the first out of the reserve, and so on down to the ones that can barely do fifteen kilometres per hour." Since that June day, Germany has proved how faithfully those thousands of reserve locomotives over her domain have been nursed and cared for, and how quickly those who were to man and ride behind them could respond. 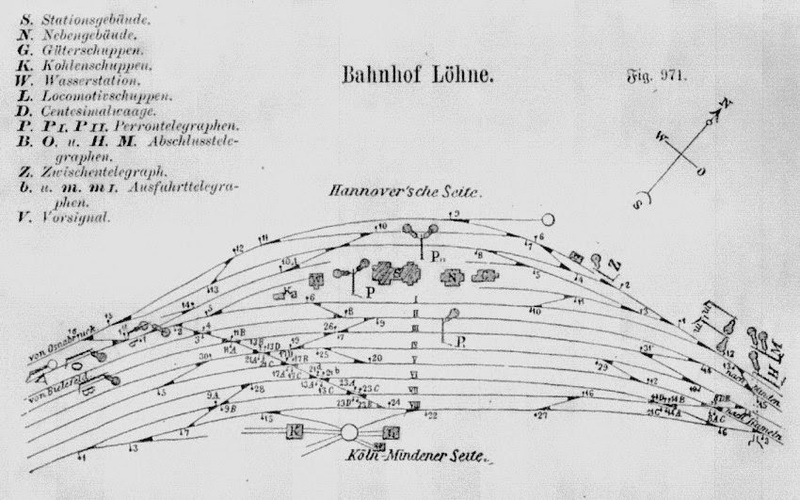 Originally from an 1885 German railway education textbook - 15 years after the Franco-Prussian War - 29 years before the Great War : A railway terminal schematic diagram as part of a standardized state railway curriculum. At this point, almost as I write, I had something explained to me over which I have at times puzzled for months. On February 14 of this year I was in Cologne, and blundered, where I had no business, into what I learned was a military-stores yard. Among other curious things were tiny locomotives loaded on flats which could be run off those cars by an ingenious contrivance of metals, or, as we call them in America, rails. Also there were other flats loaded with sections of tracks fastened on cup ties (sleepers that can be laid on the surface of the earth) and sections of miniature bridges on other flats. I saw how it was possible to lay a line of temporary railway, including bridges, almost anywhere in an incredibly short space of time, if one had the men. At one period of my life I was actively interested in railway construction, but had never before seen anything like this. Before I could conclude my examination I discovered that I was on verboten ground, and had to leave ; but the official who directed me out told me that what I had seen were construction outfits. The more I thought of those, afterwards, the more I was puzzled by the absence of dump cars, and that mass of smaller paraphernalia to which I had been accustomed in all the contracting work I had ever seen. Never, I believe, did a country so thoroughly get ready for war. I saw the oddest spectacle, the building of a railway behind a battle-field. They had diminutive little engines and rails in sections, so they could be bolted together, and even bridges that could be put across ravines in a twinkling. Flat cars that could be carried by hand and dropped on the rails, great strings of them. Up to the nearest point of battle came, on the regular railway, this small one. At the point where we were, it came up against the soldiers. It seemed to me that hundreds of men had been trained for this task, for in but a few minutes that small portable train was buzzing backward and forward on its own small portable rails, distributing food and supplies. It was great work, I can tell you. I've an idea that in time of battle it would be possible for those sturdy little trains to shift troops to critical or endangered points at the rate of perhaps twenty miles an hour, keep ammunition, batteries, &c., moving at the same rate and, of course, be of inestimable use in clearing off the wounded. A portable railway for a battle-field struck me as coming about as close to making war by machinery as anything I have ever heard of. I did not have a chance, however, to see it working under fire, for, being practically a prisoner, I was hurried onward and away from the scene. I know of nothing more than this, coming from one whom I know to be truthful, that so adequately shows how even ingenious details had been worked out for military perfection. We shall doubtless hear, after this war is over, how well those field trains performed their work when it came to shifting troops in times of fierce pressure on a threatened point, and how it added to German efficacy. The reader will perhaps ask by this time, "What has all this to do with responsibility for the war ?" I answer, "When the reader was a boy and by various efforts and privations saved money enough to buy a box of tools, did he lock them up in the garret, or bury them in the cellar ? When he possessed a fine bright Billy Barlow pocket-knife, did he whittle with it ?" However, this is not an argumentative thesis, and a good witness confines himself to what he personally considers relative, and to personal events that may or may not be regarded as significant. I hold no brief one way or the other. 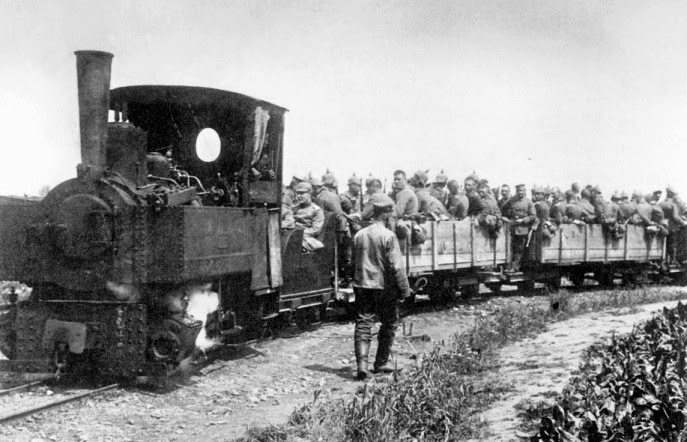 A narrow gauge German battlefield railway early in the war. As Part 3 will show, both sides made use of light railway systems in the battlefields on the Western Front. It is needless to say that I was in Berlin and packing on the following day, that immediately after I did go to Switzerland, and that still there was no open declaration of war on Germany's part. I stopped at Basle for a while, interested in that fine frontier station, and one day was amused by the extremely expressive swearing of a man who I found out was a "switchman" in the yards. He was complaining of over-work. "One might have an idea", he growled, "that Germany was going to war, from the way the German railways are ordering all their empty trucks returned from everywhere. Nothing but empties going home, and if anybody makes a mistake or overlooks one, there's the devil to pay !" I have since learned that this inflow of empty German carriages and trucks was so observable at other frontier stations, that two weeks before war was declared the German yards were swamped with this excess. Slowly assembling from the vast expanse of the Russian Empire, the Czar's army is heading for East Prussia. Passenger coaches have been provided for the officers, perhaps for food service as well. Everyone else rides in the Vista-Liners. With Russia's railways being of a 5 foot gauge (to impede invasion by rail) it will be necessary to march west from the border - unless the Germans have thoughtfully left some 4 foot 8 1/2 inch 'standard gauge' equipment sitting around for their convenience. Technically, Germany declared war on Russia just before it declared war on Russia's ally France. Practically, it needed the Schlieffen Plan to work in France so the victorious German army could quickly ride the rails of the German state railway east to stop the Russians.